We LOVE Ecwid simply based on how simple this system is to use. It's super user friendly. If you already have a custom website and you want to add product to it with inventory tracking. If you don't have a website, this system comes with a starter site which is perfectly efficient for any e-commerce company. If you have a POS system and you need to sync/mange your online and offline inventory together. Ecwid has a great range of tutorials and their help system is fantastic. *PRICING - Unlike all of the other e-commerce systems, Ecwid does not charge a payment processing fee for each purchase a customer makes on your site. Many other systems waive this fee at the higher priced level of memberships, but Ecwid does not charge this fee on any of their levels. It may not seem like a lot, but over time, this can add up to be a lot of money you will through away in fees through alternative systems. You can allow other companies to feature and sell your products on their websites! You can add your products to marketplaces like Google Shopping, eBay, and even Amazon. Some might want more than just a starter site and want to develop out multiple pages for their company. This system only comes with a starter page and is built to get a company up and selling as quickly as possible. The capability and function to add your store to your own custom website is more of a plus for us here than a con. 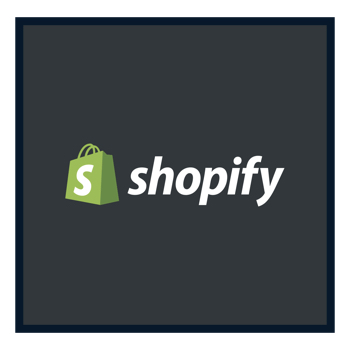 Shopify is a website and online store builder all in one. If you don't have a custom website such as through Squarespace or any other system, then Shopify would be a good option for you. Shopify also has multiple site builder templates you can choose from, some are free and some come with a fee. If you are thinking of having any of your products on Amazon, we highly recommend the Proven Shopify Course as your tutorial to getting everything dialed. Shopify has additional fees per transaction based on which plan you choose. *You can purchase the Proven Shopify Course by itself or you can get the full Proven Amazon Course Package which includes this course and all the other areas you will need to implement a successful Amazon store.